One of the difficulties of dealing with mesothelioma, beyond having to treat the cancer as aggressively as it can attack, is coping with the depression that often follows a diagnosis. This is an all-too-common emotional characteristic of someone who is diagnosed with a life-threatening illness. Dana Nolan explains how mental health counselors can help mesothelioma patients cope with their cancer. If you become depressed after your diagnosis, recognize that this emotion is normal and that there is help. Your illness may have been triggered by the diagnosis itself, by anxiety about the future or by a changing self-image. Although it is very common, it can become a significant problem for many mesothelioma patients. In fact, studies show that a quarter of cancer patients are clinically depressed. If you find that you have ongoing physical and mental symptoms of depression, seek help from a health professional. Help can come in the form of counseling, medication, support groups and therapeutic techniques. Evidence shows that more cancer patients recover from this condition when they have specialized counseling that focuses on their cancer. Together, you and your doctor can decide which treatments are best for you. Cancer treatment itself is also known to cause this illness. Certain cancer medications can have negative effects on your mood. Medications with depressive side effects commonly include analgesics, anti-inflammatory agents, hormones, steroids and some chemotherapy drugs. It is important to tell your loved ones and your doctors how you are feeling so they can help. Cancer patients may experience depression for a variety of reasons, but certain factors have been found to play a large role in its onset. For example, your mesothelioma diagnosis can lead to serious complications about your financial concerns, your family’s future and major changes in your daily lifestyle. A changing self-image can contribute to feelings of sadness, as well, as treatment can often change your appearance. Chemotherapy, for instance, can cause hair loss. Some treatments can make you gain or lose weight. Some may affect your skin. In addition to these treatment side effects, general fatigue can make it difficult to keep up with your appearance. It can take time to adjust even to minor physical changes. Related drops in self-esteem can contribute to your feelings of depression. Some people tend to hide their emotions from family and friends when they get sick, which only worsens the problem. These patients tend to isolate themselves from loved ones and not communicate effectively. Or they may act as if nothing is wrong and appear to be in an especially good mood. Both of these techniques are used by patients to distance themselves from their surroundings. Becoming disconnected in these ways can speed along any mood disorder. Did You Recently Become a Mesothelioma Caregiver? 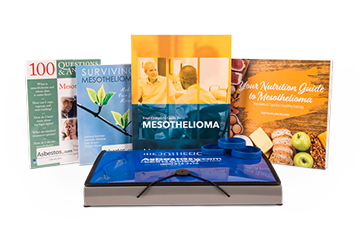 Learn tips and strategies from real mesothelioma caregivers who are experienced with the disease. Depression affects 25 percent of cancer patients. Clinical depression has been found to affect 25 percent of all cancer patients, affecting male and female patients equally. This rate, which is four times higher than average, may be even higher for mesothelioma patients. Evidence shows the rate climbs among patients whose cancer has progressed, which includes most mesothelioma patients. In fact, one study found that this mood disorder affects 77 percent of bedridden cancer patients. It can be difficult to conclusively recognize this illness, but certain physical and mental symptoms can be clues. Although everyone feels sad or down at times, symptoms of clinical depression last more than just a few days and can greatly interfere with everyday life. Be sure to note if symptoms are severe or continue for more than a week. Keep in mind, however, that many of the physical symptoms may be a result of cancer treatments and may linger for a period after treatment. If you are suffering from depression, there is help. Many kinds of medical professionals can treat this condition. Depending on a patient’s needs, doctors may suggest support groups, refer patients to a mental health professional for counseling or prescribe antidepressants. The most popular antidepressants fall into two categories: selective serotonin reuptake inhibitors (SSRIs), and serotonin and norepinephrine reuptake inhibitors (SNRIs). If you are considering antidepressants, check with your doctor to make sure the new prescription will not interfere with other treatments. Certain medications can negatively interact with cancer treatments or other prescriptions. Before beginning any new medicine, make sure it does not affect other treatments, and make sure you understand all potential side effects. It is also a good idea to discuss your new medicine with a family member or caretaker. That way, if you have any medical issue, your relative or caretaker can inform emergency doctors of all your medications to ensure that you are safely treated. In addition to medicine, or instead of it, seeing a mental health professional or joining a support group can help. Group therapy is a good choice for someone dealing with new emotions. It can help someone express and validate feelings. Choose a group that suits your needs. Visit The Mesothelioma Center’s support group page for more information about group therapy and to receive help finding a meeting near you. Learn from others by joining our monthly online support group run by a certified counselor. Similarly, one-on-one therapy can help you mentally cope with your new situation. Find a therapist who is familiar with cancer care. One recent study by Cancer Research UK found that patients did better emotionally when they received counseling from cancer professionals. The 2008 study was performed with 200 cancer patients suffering from depression. Half received antidepressants and mental health referrals. The other half received this standard care in addition to several counseling sessions with a trained cancer nurse, called “Depression Care for People with Cancer” (DCPC). Patients who received the DCPC care package showed a 23 percent lower rate of depression than those receiving standard care. Other studies may be able to explain such a vast difference. Research has shown that cancer patients do best when their therapy includes educational and behavioral approaches. This includes exploring patients’ beliefs about a cancer diagnosis and clearing up any misconceptions. A greater understanding of the diagnosis and treatment can help reduce feelings of helplessness and anxiety. This therapy approach should also include new relaxation techniques such as yoga to help alleviate the physical symptoms of depression.